This is my nightly prayer – though often said in my mind rather than with my mouth – as well as my charm of protection whenever the need arises for one. This came to me many years ago after first reading “The Descent of Brigid,” based on verses in the Carmina Gadelica, as well as several other protective charms to the Irish goddess and saint called Brigid, Brigit, Brig, or Bride, depending on your preference. If you are unfamiliar with this deity, this article on The Order of Bards, Ovates & Druids is a good place to catch up. Many people remember Brigid at her February festival of Imbolc, which many of us celebrated last week. We make a Brigid’s cross or bed, maybe eat some dairy-based dishes, sing one of her songs or another, and say a prayer to her. Then many seem to forget her with the coming of spring and festivities of Ostara and Beltaine. It seems that she was the goddess du jour when I was coming into Paganism in the late 90s. There does seem to be an inclination to be interested with the goddess of the moment, which blogger Daughter of Avalon discussed in her post “The Goddess Trend.” In it, she discusses how the changing world may be encouraging us to look at specific goddesses, rather than just following a trend. 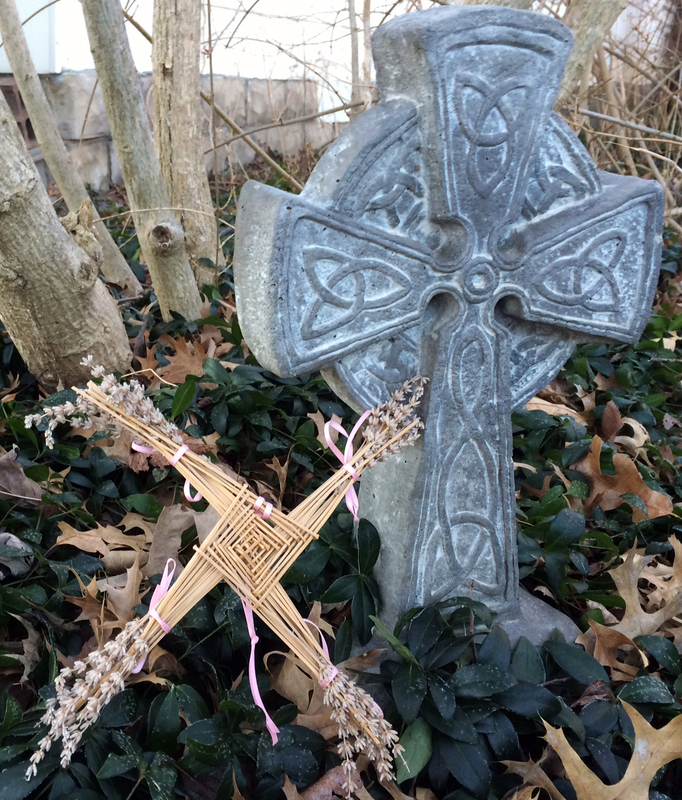 A Brigid’s cross of lavender stems and a Celtic cross both cross the threshold between Pagan and Christian. Yes, Brigid has the advantage of being at the center of one of the four fire festivals, Imbolc, where people weave reeds or straw into her crosses or eat dairy foods to represent the return of the milk. But many people forget her after that. And many who once revered her have since left her for the goddess of the moment. It’s a bit sad to me that more people who start with Brigid (and so very many of us did) decide to forget or abandon her for a different goddess. As a multifaceted deity, she can fit into almost any societal mood. She is the strength and fire to forge both swords and plows. She is the healer of people, animals, and sovereignty – not to mention legendary midwife to Mary and Jesus (clearly an embellishment to her legend, but it could offer a clue to her earlier veneration). She is the breath of inspiration to the poet and artist. She is the protector who lost and frightened souls call upon for strength. She is the goddess that stands on the threshold and holds hands with Pagans and Christians on either side. She – much like the Celtic cross in some myths – is a symbol of two cultures combining. Considering many of us live in places where we are a spiritual minority, she may remind us to respect those who walk a different path, especially if we expect the same courtesy. However popular she may or may not be, she is in my heart always. She was my first goddess. Not necessarily the first one I learned about after coming to the Pagan path in 1997, but the first one I felt called to. My only connection to community early on was a subscription to SageWoman magazine. The second issue I received was #40 Angels & Guardians, in which Diana Paxson’s long-running “One of Ten Thousand” column featured Brigid in her protector aspect. And just a year and a half later, Paxson’s column in Issue #46 again focused on Brigid but in her inspirational role. The Daughter of the Dagda had certainly caught my attention with her dualities of gentleness and burning flame, healing and forging. Not much later, I performed a self-dedication to Brigid. 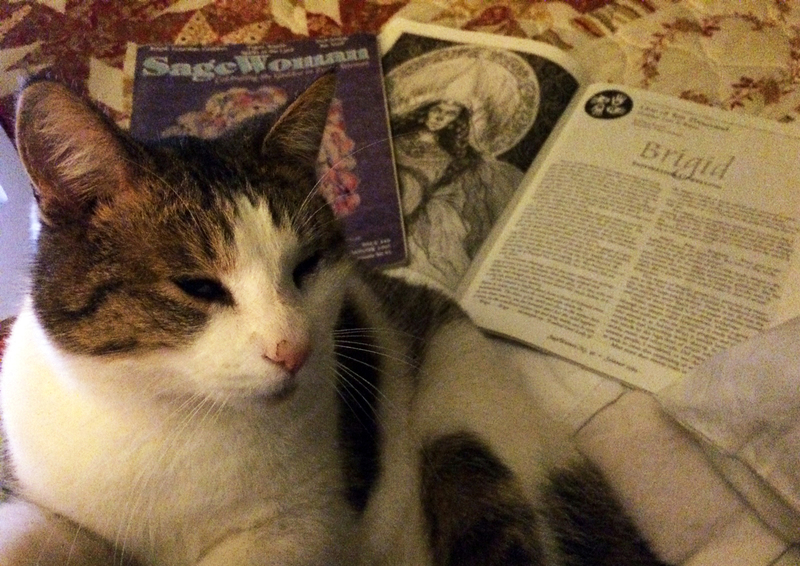 Sagewoman articles – cat not included – were my introduction to this versatile goddess. Thinking back on it now, it seems she was especially attractive because she’s just as complex and multidimensional as all of us are (no matter how society may try to trim us with its cookie cutters). None of us are flat characters – some of us just appear that way because we’re afraid to show our real selves to the world. Like many others who follow Pagan or goddess spirituality, I have no problem in honoring and working with multiple deities. And while Cernunnos, Abnova, the Morrigan, Lugh, the Green Man, and Airmid are all ones I feel connected to, Brigid remains the cornerstone of my spiritual foundation for the reasons above and many more. So by all means, enjoy making a Brigid’s cross and eating custard on Imbolc, but please don’t forget about good Brigid the rest of the year. She is there for you no matter the season.